If you are looking for a tool that can help and improve your browsing experience, then we have the perfect app for you. 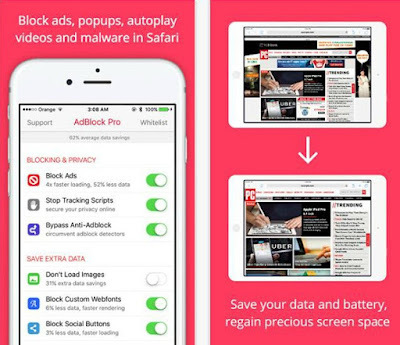 We're talking about AdBlock Pro, one of the best iOS utilities. This app is Safari extension for blocking ads and it is really simple to use, with incredible features and pleasing design. Simply download and start AdBlock Pro and you will quickly figure out how it's working. You will be able to configure it within few seconds and then to block ads and banners, autoplaying videos, YouTube video ads, fake "x" buttons, scrolling banners, timed pop-ups and tons of other annoying ads that can interfere with your browsing. AdBlock Pro features bypass anti-adblock detectors, sync settings option and built-in button for quick changes. You will be able to make the browsing for your kids too, by blocking adult content on your Safari browser. If you're ready to experience ad-free, 3-5 times faster browsing, about 53% lower data usage and improved battery life, download this app now. You can find it on the App Store, where it is free of charge.